An era of myths, heroes and philosophers. The essentional beauty of the nature, the historical sites that are spread all over the island and the charming mountainous landscape of Samos create a unique atmosphere which enchants the visitors and carry them in another era. In an era of myths, heroes and philosophers. 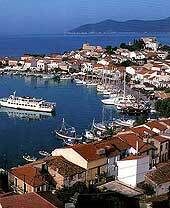 Samos’s location played a great role in its development. It lies in the Eastern Aegean, very close to the coast of Asia Minor, in the heart of Ionia, almost midway along the sea route that links Greece with Anatolia, the Black Sea, Egypt and the Eastern Mediterranean. Beautiful and green, this island, is filled with wonderful beaches, picturesque villages and harbours.The nature of the island, the climate and the archeological interest have turned this island in a resort which gathers many tourists. 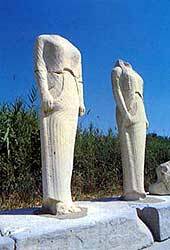 The greatest intellects and artists of the time were from Samos. The mathematician-philosopher Pythagoras, with his celebrated theorem, the cornerstone of geometry, along with Rhoikos and Theodoros, the architects of the Sanctuary of Hera and pioneering sculptors, are the best known. Apart from its natural beauty, lovely beaches and the lush vegetation of its mountains, which are of enormous interest to collectors of aromatic medicinal herbs, the visitor can explore its archeological sites, the Heraion and the Tunnel of Eupalinos, its museams - the Archeological and Byzantine in Samos town, the Library and Historical Archives, and the Paleontological Museum with its fascinating finds at Mytilinii. One can also visit the monasteries and view the frescoes at Megali Panayia, the Panayia Vrontiani, Agia Zoni, and Zoodochos Pighi. In addition, the old industrial buildings - the tanneries at Karlovasi, the tobacco plants in Samos town, the wineries at Agios Konstantinos, and many others - remind one of the civilization and way of life in Samos in earlier times. And do not forget that ancient Anthemousa (as the island was once called), with 1,100 known species of plants, including aromatic and medicinal herbs with a prehistory of thousands of years, has apart from its exceedingly tall plane-trees, a large number of wild orchids (about 50). Furthermore, each village with its church, school, houses clustered around the main square, gardens, vineyards and small olive groves, as well as the chapels scattered among its prettiest spots, makes a delightful picture, a magnet as it were for every foreigner who travels to Samos. Gaggou, Kokkari, Lemonakia, Tsamadou, Avlakia, Potami, Agia Paraskevi, Mourtia, Posidonio, the famous Psili Ammos and Mikali are some of the beautiful beaches of the island. Windsurfing, tennis and climbing.If you don't have a surfboard you can rent one on the island. Discos and cinemas can be found in the city of Samos, Pithagorio and Kokkari. 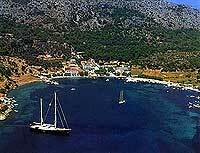 In the city of Samos you can find night clubs and pubs.